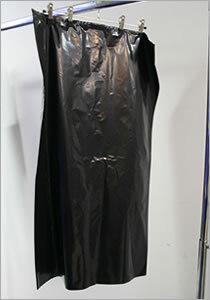 Garment bag, that we use for storing latex clothing. Made of black polyethylene foil. 60 cm wide and 100 cm long. With side gussets, 20 cm deep. At the top with a hole for a hanger. The hanger shown in the picture is not included in the price. You can find matching hangers under latex storage.